Grant from Eastern Bank Charitable Foundation will support after-school health, wellness, and life skills for adolescent girls in Plymouth County. 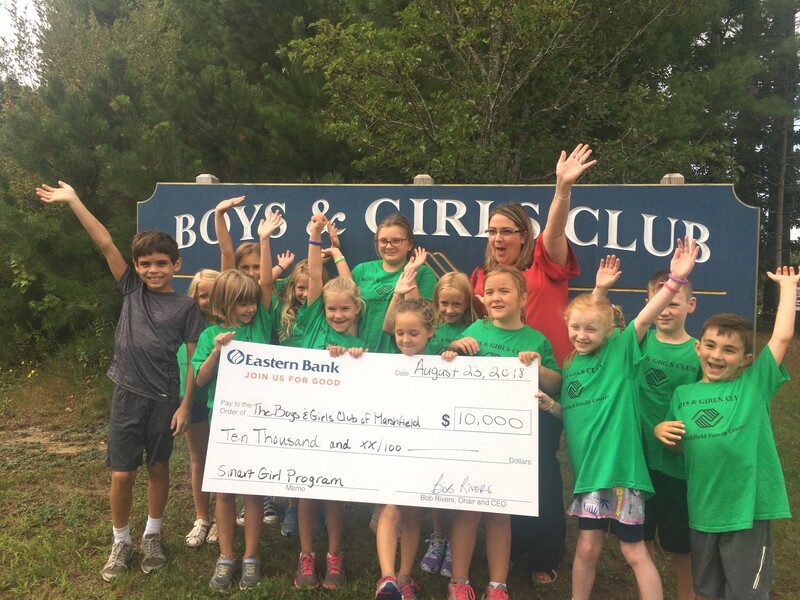 The Boys and Girls Club of Marshfield, a youth development organization, has received a $10,000 Targeted Grant from Eastern Bank, America’s oldest and largest mutual bank. The grant will support The Boys and Girls Club “SMART Girls” program for their entire female population. SMART Girls is one the Boys and Girls Clubs’ top programs, and is a targeted curriculum that ensures girls get the right information and the right support at the right age. Separate modules are tailored to three age groups. The interactive, engaging, small-group sessions engender trust and positive self-image, while teaching good decision making regarding personal health, wellness, choices, and relationships. This program is targeted to increase young women’s positive self-esteem by providing access to female mentoring relationships, building confidence, encouraging self-advocacy, and addressing mass and social media’s influence in self-esteem and body issues. SMART Girls gives girls the space, support and tools to navigate adolescence and to emerge strong, healthy young adults. Each year, the Eastern Bank Charitable Foundation’s Targeted Grant program supports hundreds of community-based organizations working for progress on a specific issue in Eastern’s New England footprint. In 2018, in celebration of the Bank’s 200th anniversary and to honor its first depositor, Rebecca Sutton, Targeted Grants have been designated to support organizations addressing a range of issues that disproportionately impact women, such as sexual assault, domestic violence, human trafficking, health care, pay equity, and senior management and board representation. The Boys & Girls Club of Marshfield is among 170 nonprofits each receiving a $10,000 grant. In total, Eastern is granting $1.7 million in Targeted Grants this year to nonprofits in communities from New Hampshire to Cape Cod and throughout the South Shore, North Shore, Metro West, Merrimack Valley and Greater Boston. Eastern’s Targeted Grant program this year creates new opportunities and resources for women in areas where assistance is needed the most. The facts are staggering:- A woman is assaulted every nine seconds in the U.S. and one in three women has been a victim of physical brutality by an intimate partner, making intimate partner violence the single greatest cause of injury to women. The Boys and Girls Club of Marshfield (the Club) is a youth development organization providing programs and services to children and families throughout the greater South Shore community. The Club’s mission is to enable and inspire all young people to realize their full potential as productive, caring, responsible citizens as well as become tomorrow’s capable leaders. The Club provides programming opportunities in Boys & Girls Club of America’s (BGCA) five core areas including leadership, education, health, arts, and fitness. Currently, the Club serves hundreds of families with children ranging in age from 6 to 18 years old, providing afterschool, vacation week and summer programs, as well as youth athletics, teen, social recreational and leadership opportunities. For more information, visit their website http://marshfieldbgc.com or call 781-834-2582.